The Robot Chicken parodies of Star Wars are ten times better than Family Guy. Which is why I'm so excited they're launching a new series parodying Star Wars called Star Wars Detours. Family Guy is pretty funny and they've got three DVDs out, so they're very popular. 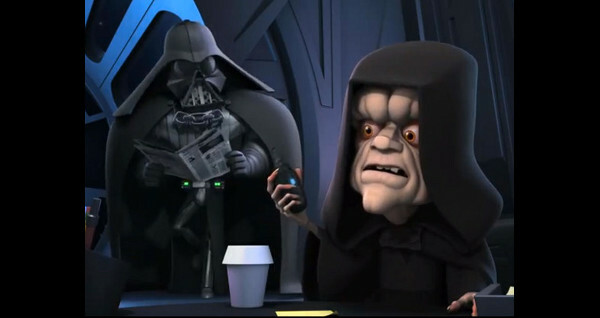 Sketches like Emperor's Phone Call from Vader and Admiral Ackbar cereal prove Seth Green and the guys at Robot Chicken know funny. This series should be awesome. The series takes place between between Star Wars Episode III and IV, but they make fun of Star Wars 2 (Attack of the Clones), Star Wars 3 (Revenge of the Sith) and more. They may even make fun of lego Star Wars eventually. Here is the trailer and six clips from the new series. Watch them and decide if they're the funniest thing you've seen today. Introducing Star Wars Detours: the other side of the stars, between the wars. The Emperor's love of gossip endangers the secrecy of the Death Star. A peek into the domestic life of Han Solo and Chewbacca. Dex learns you can never trust a teenage celebrity. Super Ace and Killer deal with the Death Star's shortage of bathrooms. Greedo picks the wrong disguise to sneak into Jabba's Palace. At a Coruscant job fair, Obi-Wan believes the Force is strong with Harmony. There's no announcement of when Cartoon Network will be airing the show. But you can watch more Star Wars online and check them out on Facebook. What do you think? Will Star Wars: Detours be a hit or a flop? If you've seen the Family Guy parodies is this better? Poll: What's The Most Quotable Geek Movie Of All Time? 7 Reasons Why "Star Wars" is Funnier Than "Star Trek"
The problem with the Family Guy ones were they did the whole story for each movie, whereas Robot Chicken just does sketches through the whole Star Wars universe so they have a lot more leeway on what they can and can't do. Anyway, I hope they show this on Adult Swim at some point. Watched those the other day - funny. And the Family Guy ones ran out of steam by the third movie. i have fallen asleep watching family guy's versions.. i fall asleep during most cartoons... yes it's cause i am old. Pat, the format works better for short clips. I'm surprised it's not on Adult Swim. I could watch the Billy Dee clip all day Alex. I can't wait for this! Family Guy was funny, but it was funny in a Family Guy as Star Wars kind of way. This will be funny in a Star Wars cartoon sort of way - instead of trying to mesh 2 properties worth of jokes- they will only have to worry about Star Wars jokes with a bit of a nod to other popculture.... I can't wait to be able watch this with my son. Hey, Chew. I'm bacca. lol Great stuff. Based only on the trailer, it's like Family Guy via Hoodwinked.